Update design style, trending wine display format and contemporary materials – Wine Enthusiast has answered the request for a more transitional wine racking system with Parallel. 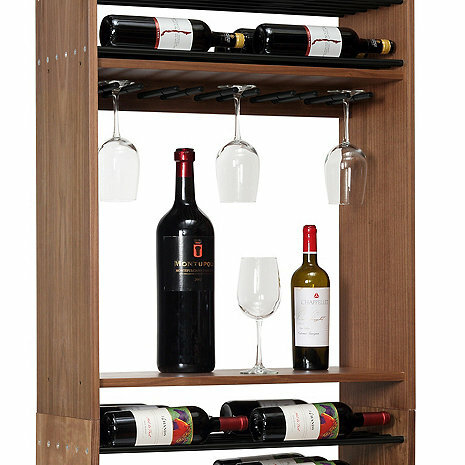 Metal wine display hardware spans a walnut wood structure to house and display wine in a unique format that focuses attention on your wine. Simple, clean lines are achieved with as the wood vertical sit directly on the floor with no base platform or moldings. The vertical casework sides are pre-drilled for easy horizontal Parallel rod assembly. The vertical casework sits on the finished floor with optional concealed feet levelers, the wine rack is secured to the wall with provided wall bracket and a second unit can be seamlessly stacked to achieve a 7-foot height. Assembly instructions and hardware included. Cordless drill (not included) required for assembly. Options and upgrades include: finished end panels, LED display lighting and controls (with stand-off brackets), adjustable feet and additional wall mounting brackets. Want to create a wine cellar with Parallel Wine Racks? Send us a preliminary wine cellar sketch via email or fax. Then call us. We'll design your wine cellar for $99 with the design fee credited towards your purchase. What is the exact length and width of this unit? I don’t have much space to mount it.